And I’m here for it, y’all! I was just expecting new Too Faced announced their Born This Way Collaboration with Jackie Aina. It didn’t stop there, though! Too Faced owner Jerrod Blandino decided to expand the entire Born This Way Collection. Adding new shades of foundation and powder. Plus, whipping up a brand new full coverage concealer. I’m impressed! It’s nice to see Too Faced finally come around and join the dark side! It seems many brands are jumping on the inclusive wagon these days. Part of me is here for it. Especially when it’s genuine and done right. Like what Too Faced did with Jackie Aina. Jackie Aina went to the lab to whip up 11 new shades for light and deep skin beauties. 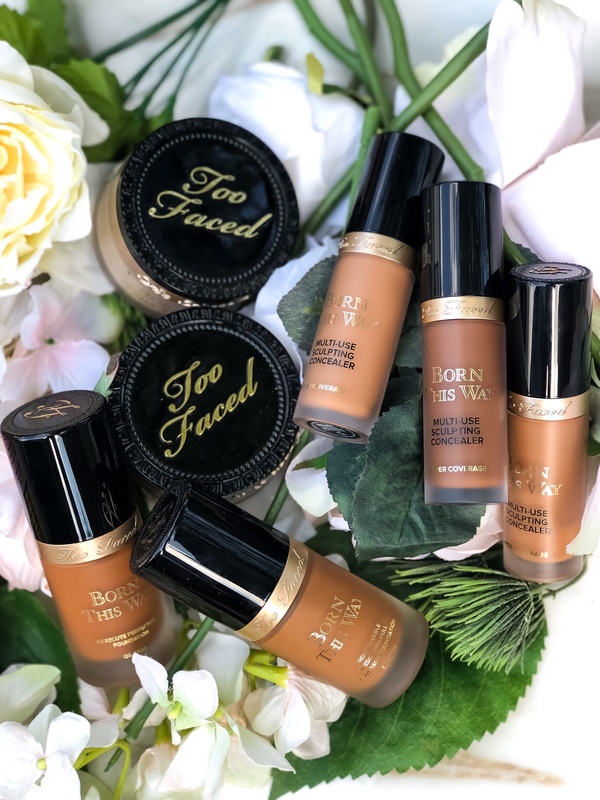 A huge deal for Too Faced who typically focused on just light to medium skin tones. Now, we’ve got a wider shade range that encompasses all skin tones. I was even able to find a new match in the Jackie Aina collab. You can see my comparison swatches + review here. Or check out my original Born This Way review here. Too Faced didn’t stop at new foundation shades. Nope! Jerrod decided to expand the entire Born This Way Collection with a new line of full coverage concealer. We’ve seen a Born This Way Concealer before but nothing like this! The original Born This Way Concealer is very fluid with buildable medium coverage. The new Born This Way Super Coverage Multi-Use Sculpting Concealer is thicker, creamier and full coverage fresh out the gates. There’s 20 shades ranging from fair to dark. Half of them are suitable for people of color. Which I’m really digging! For once, I actually struggled picking a highlighting shade. Eventually I decided to get both of my picks: Maple and Chestnut. Both work extremely well with my skin tone. With Maple being more suitable for dramatic, night looks. And Chestnut working more for everyday wear. I also grabbed Cocoa to contour. The formula is easy to apply and wears extremely well. I notice very little creasing with the Born This Way Super Coverage Multi-Use Sculpting Concealer. Which is saying a lot for me! Literally all concealers crease on me. So this is pretty much holy grail status! You were wrong if you thought the Born This Way expansion stopped at foundation and concealer. Nope! There’s new shades of the Born This Way Ethereal Setting Powder too! Originally, there was just Translucent. Now we have Translucent Medium and Translucent Deep, too. I already own the OG Born This Way Ethereal Setting Powder and I really like it. It’s silky, lightweight and a bit brightening too. So I prefer to use it to set my concealer. I opted for Translucent Deep to set my foundation. Surprisingly, it’s actually a little dark for me! I’m not too mad about it though. It’s nice to see a mainstream higher end brand put out a nice, deep setting powder. We’re definitely on the the right track! The New Born This Way Collection is a Go! Overall, I’m really digging the new Born This Way Collection. And direction Too Faced is headed these days. Everything seemed really well planned and thought out. From the new shades to the new concealer formula. I’m curious to see if Jerrod will continue to expand the collection from here. As it can only get better! You can check out the new Too Faced Born This Way Collection at your local Sephora and Ulta Beauty.